The two marble fountains are landmarks in the park – or were, because the top parts of them have now been removed for repair and conservation. I sketched them a while ago when I heard they were to be dismantled, not knowing exactly when they’d be going, and as always I discovered a lot of things I’d never seen before. That’s what drawing does! The lower bases are more or less the same, except that the south fountain has a carved mouse crouching under a lily leaf, so badly eroded it’s almost impossible to find, and the north one has a lizard, only slightly more visible – both difficult to draw because of their rather blurry state (I tried several times and never succeeded in getting anywhere). 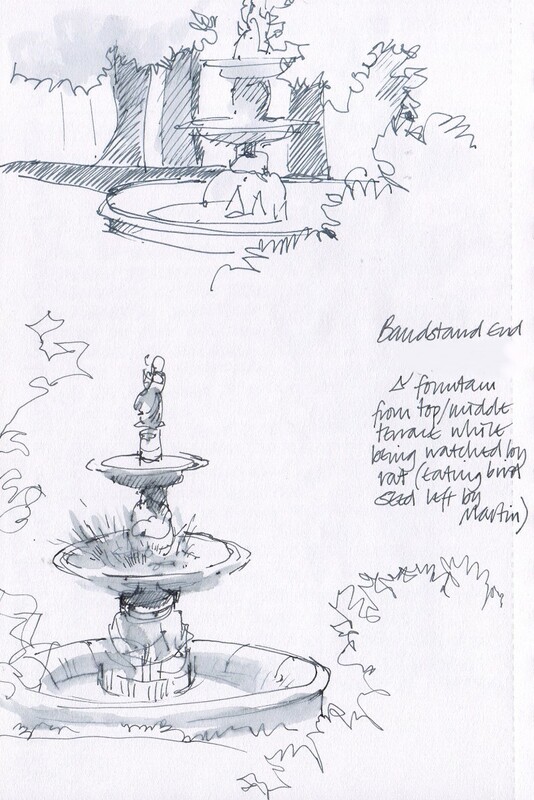 But the middle part of both fountains – the first tier – are much easier to draw. 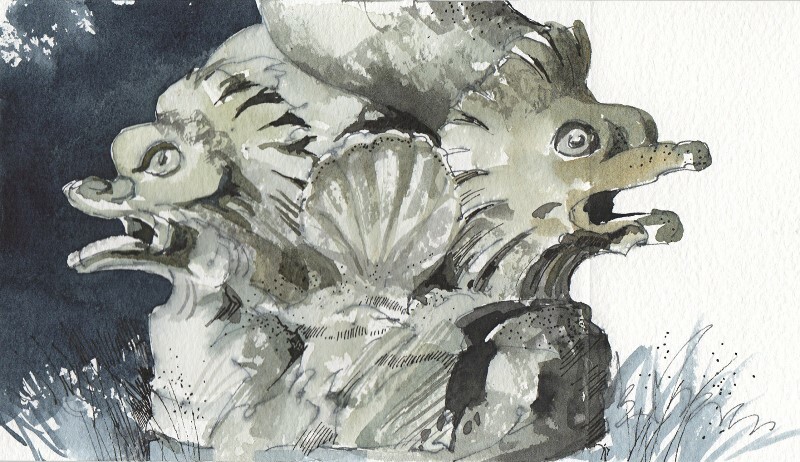 These fabulous fishy creatures are curled around each other and water must have once spurted from their open mouths. I feel sure they’re dolphins, even though no dolphin ever looked quite like that. They form the support for the second tier, and this is where the two fountains are quite different; the south one has a cherub clasping what must have been a large fish, but both fish and cherub have lost their heads and all that remains at the top is the metal spout that would once (presumably) have come out of the fish’s mouth. 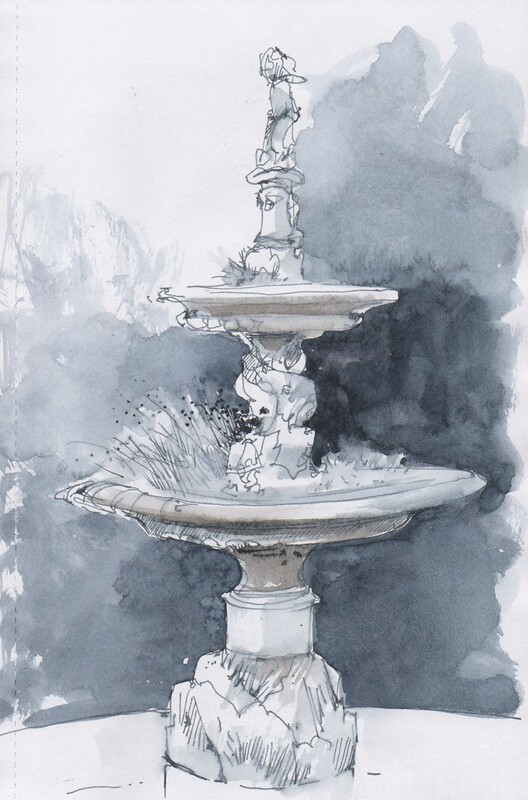 I’ve been wondering if there are photos or drawings of the fountains in their original state that can be used as reference in their restoration – it’ll be difficult if no pictures exist. 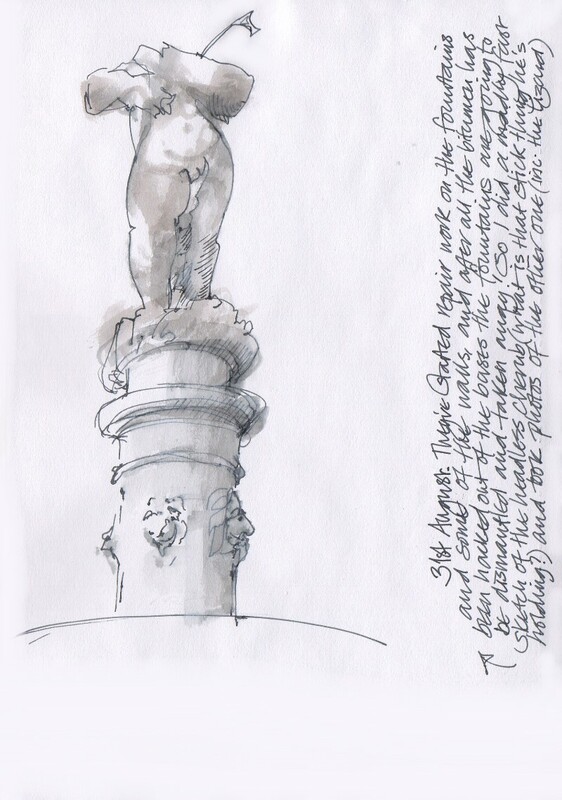 I don’t know when cherub and fish were beheaded, but it’s said that someone climbed the fountain one night in a drunken state and knocked off both their heads. The north fountain is topped with a chubby cherub mounted on a huge feathery bird which looks to me like a goose – or could it be a swan? His fat little legs straddle its back and his arms are wrapped securely around its neck which stretches upwards as it flaps its wings – it’s wonderful. I can’t wait to see how it looks when water is once again spouting from the bird’s beak….. 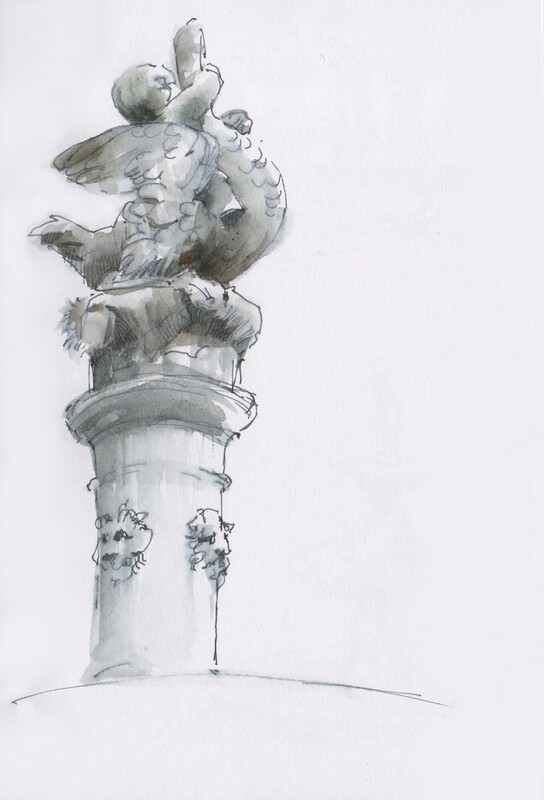 Both fountains have little lion’s heads decorating the columns under the cherubs and as I was sketching them I thought this is a bit odd, as they’re not part of the watery fishy theme (even the mouse and the lizard have their logical place in the natural surroundings of the rocky base). I’d like to know who decided lions would be a good idea. We’re they part of the commission, or did the Italian stonemason just find lions irresistible? What next? I missed the actual moment of the dismantling and removal of the fountains, which was frustrating, but luckily I’ve been supplied with photographs. Now they’re gone, for the moment, but they’ll be back – with a full complement of curious creatures and restored to their former glory. I can hardly wait! More updates on the work of the conservation project, photos, plans, and background information at:https://m.facebook.com/Cliffe-Castle-Heritage-Lottery-Bid-304048249751094, at the Cliffe Castle Park Conservation Group website and on the Parks Service page of Bradford Leisure Services. I so look forward to your post on this park and it’s restoration. What a wonderful documentation. I have admired your talent from years ago when I bought a “cottswald” home original watercolor from Covent Gardens when I visited the UK many years ago. You are an inspiration and these post make me want to visit this garden when completed. Thank you for sharing your talent and artistic observations. How lovely to hear from you! I remember you contacting me before – it’s so nice to recall those days when I was selling in Covent Garden. I’m glad you’re enjoying these posts that I’m doing on Cliffe Castle Park – it’s a fascinating project to be involved with and I’m lucky that it’s just on my doorstep. This is just the sort of drawing work that I’ve always loved the most. And I’m very happy to know you’ve been following this blog! It’s great to join with you in looking closer. Love the details both in sketches and your verbal descriptions. Especially enjoyed the fish at the base of the north fountain!